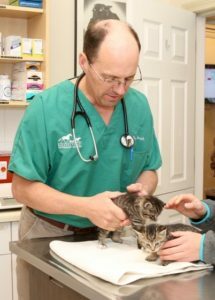 Dr. Smith joined Nashoba Valley Veterinary Hospital in 1993 and became a partner of the business in 1999. After receiving his undergraduate degree from Middlebury College, he graduated from University of Pennsylvania School of Veterinary Medicine in 1993. Dr. Smith resides in Groton, MA with his wife and two daughters along with their lab, Lego, two cats, chickens and their newest addition, Arli, a golden retriever puppy. When not working, Dr. Smith can be found traveling with family, playing hockey, skiing, mountain biking and fishing. 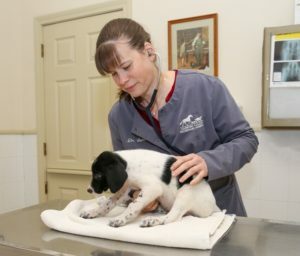 Dr. Sarah joined Nashoba Valley Veterinary Hospital in 2006. She holds a Bachelor degree in Chemical Engineering from Cornell University. After working in the computer industry, she decided to become a veterinarian. She graduated from Tufts School of Veterinary Medicine in 2006. During vet school she worked at a sheep breeding farm and at a dairy farm. After vet school, she joined Nashoba Valley Veterinary Hospital. Dr. Sarah now resides in Littleton, MA. She lives with her wonderful husband, Will, two boys, two dogs and cat. Outside of work, she enjoys running and sled dog racing. Steve Fromer is our practice manager. Jackie has been a veterinary technician with us for 4 years and brings great energy to our office. Beth has been with us for almost 20 years as a veterinary technician and kennel assistant. She lives in Chelmsford with her husband and son, cat and two birds. When she’s not caring for animals at work she enjoys cooking , painting and all things creative and crafty. Meg is a veterinary technician for us. When not working with us, she can be found working for Animal Control, caring for her many dogs or sled dog racing. Valerie has been a receptionist with us for 26 years. When not working she enjoys antiquing and spending time with her dogs. Cathy has been a receptionist with us for 26 years. Jenna has been a receptionist with us for 4 years now. When she is not at work, she enjoys four wheeling, country music and hiking with her dog, Meika. Aprile our kennel manager has been with us for 20 years. She is devoted to all of her four legged friends in the kennel.